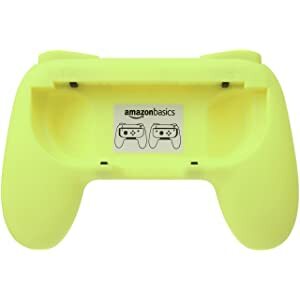 Rule your gaming world with help from the AmazonBasics Grip Kit for Nintendo Switch Joy-Con Controllers. The kit enhances the comfort of your Joy-Con controllers, ultimately giving you even greater control. The kit includes two controller grips and two thumb stick grips. The ergonomically designed grips make your Joy-Con controllers more comfortable to use, which is especially helpful for long gaming sessions. Offering a natural feel and a secure hold, the grips let you focus on the task at hand—maneuvering successfully through your immersive gaming world. Made from ABS to ensure a high level of toughness and strength, the grips effectively protect your Joy-Con controller from everyday wear and scratches. 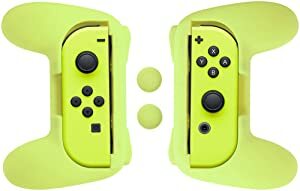 The grips allow for traditional game play with Joy-Con controllers. With the grip in place, you can still access all the Joy-Con buttons for full, functional gameplay with no restrictions. Each controller grip offers the perfect size and shape for easily sliding your Joy-Con controller into place. 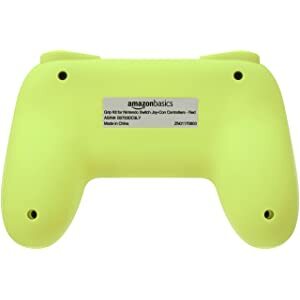 You can remove your controller from the smooth grip just as easily, ensuring simple on/off as needed. 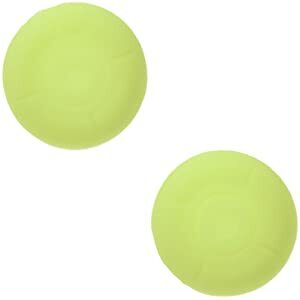 No need to worry about sweaty thumbs thanks to the two included thumb stick grips. Simply slide the precision-fit grips over the analog stick of each controller for enhanced comfort and control.